Two men released from the war on terror prison at Guantanamo Bay have appeared in a video posted by Sada al-Malahim on a jihadist website, on Friday 01/23/2009, the SITE monitoring service has reported. One of the two former inmates, a Saudi man identified as Abu Sufyan al-Azdi al-Shihri (pic on top), 35, prisoner No.372, was transferred from Guantanamo to Saudi Arabia on 12/29/2007 (see – Gitmo 12.29.07 ). Since his release he has been elevated to the senior ranks of Al Qaeda in Yemen. The site described Abu Sufyan al-Shihri the top deputy in “Al-Qaeda in the Arabian Peninsula” – AQAP, a Yemeni offshoot of the organization. The group has been implicated in several attacks on the USA Embassy in Yemen’s capital Sanaa (see – Sanaa 09.17.08 ). 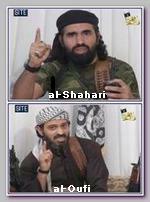 Three other men appear in the video, including Abu al-Hareth Muhammad al-Oufi (pic beneath ), prisoner No.333, identified as an Al Qaeda field commander. A Pentagon spokesman, Commander Jeffrey Gordon, declined to confirm the SITE information. “We remain concerned about ex-Guantanamo detainees who have re-affiliated with terrorist organizations after their departure,” said Gordon. On the video, Abu Sufyan al-Shihri is seen sitting with three other men before a flag of the Islamic State of Iraq, the front for Al Qaeda in Iraq. “By Allah, imprisonment only increased our persistence in our principles for which we went out, did jihad for, and were imprisoned for,” Abu Sufyan al-Shihri was quoted as saying. The other men in the video are identified as Commander Abu Baseer al-Wahayshi and Qassim al-Raimi (also known as Abu Hureira al-Sana’ani – From Sanaa, Yemen’s capital). The US Defence Department has said as many as 61 former Guantanamo detainees – about 11 per cent of 520 detainees transferred from the detention centre and released – are believed to have returned to the fight (see – Gitmo-the end ). * Abu Sufyan al-Azdi al-Shihri was reportedly killed, with six others in the Hadramawt area in an operation in southern Yemen, government officials said on Monday 09/10/2012. . Military sources, however, said it had no information on the death and refused to confirm it. But the sources did confirm that the area was subject to air raids. Separate Yemeni sources said another Saudi and an Iraqi national were among the other people killed in the operation, which took place on Wednesday 09/05/2012. ** Al-Qaeda in the Arabian Peninsula – AQAP confirmed, ON 07/17/2013, the death of Said Al-Azdi al-Shihri in US drone strike, but gives no date for killing.